Leaving your financial adviser — and finding a replacement — is a daunting challenge. Our very own Sally Brandon’s latest post in Money Magazine explains why firing your adviser, while uncomfortable, could be a necessary step toward a stronger, more secure retirement. Firing a financial adviser can be uncomfortable, but certain circumstances make it necessary. Should I stay or should I go? It’s a question people regularly ask, not just about their significant other but also about their hair stylist, their personal trainer, and, yes, their financial adviser. 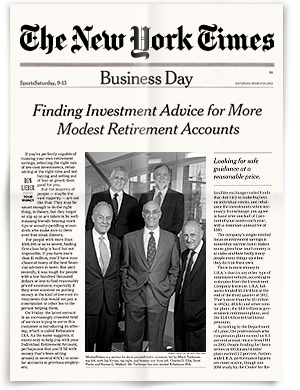 The idea of leaving your financial adviser — and having to find a replacement — can be daunting. It involves a lot of research, paperwork, meetings, and time. Lots of time. All that and still no guarantee that this new adviser will be any better than the old one. But things are changing. Consumers with money to save and invest now have more affordable, higher-quality investment options to choose from. As a result, more and more people are rethinking their long-term relationships with their financial advisers. Four percent to six percent of U.S. investors change financial advisers in a given year, according to a 2014 survey by Spectrem Group, a firm that researches investors. The reasons for these break-ups vary, but ranking high on the list are a lack of communication, frustration with complex or hidden fees, and major life events such as death, divorce, or inheritance. It was the death of a parent that started the ball rolling for one of my clients. A smart, savvy, and accomplished woman in her mid-30s, she juggles a demanding career, marriage and motherhood. When her father, a successful real estate developer, passed away unexpectedly, she and her sisters inherited money and securities. They also inherited his long-time financial adviser. For years, her father had trusted this adviser to work in the family’s best financial interests, and she had no plans to end the relationship. The emotional loyalty factor made it hard to jump ship. Besides, she was only paying the typical 1% fee for decent portfolio growth. Then she did a little digging and some comparison-shopping, just for her own education, and discovered she was wrong. In fact, her adviser had invested her in an actively managed fund with significant fees. He also had recommended a new fund for her — one with a front-end load that took 5% off the top. When all was said and done, she was paying 2.3% in annual fees, not the typical 1%. Not only was she surprised, she was furious. She felt like a trust had been broken, which is understandable. As she told me, if the financial adviser had disclosed all of the funds and fees up front, she might have reacted differently. But he didn’t, and that made it much easier for her to leave and take her retirement account with her. So if you’re re-evaluating your adviser’s performance, consider what’s important to you and your financial goals. Do you want better communication, a lower risk factor, lower fees? Or is it just time to shake off the inertia? Whatever your reasons, if the relationship isn’t working for you, don’t be afraid to kiss it goodbye. Sally Brandon is vice president of client services for Rebalance, a retirement-focused investment advisory firm with almost $250 million of assets under management. In this role, she manages a wide range of retirement investing needs for over 350 clients. Sally earned her BA from UCLA and an MBA from USC.